With the number of people traveling between Japan and Sri Lanka witnessing a sharp increase, from 5,000 to 20,000 within a short time frame, the Japanese Embassy in Colombo signed a contract with VFS Global to open dedicated visa application facilities for more accessibility to the residents of Sri Lanka and other nationals travelling to Japan. 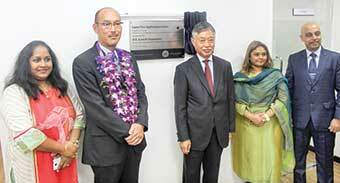 The Japan Visa Application Centre, located in the heart of Colombo and operated by VFS Global, was inaugurated by Kenichi Suganuma, Ambassador of Japan to Sri Lanka on Friday. Ms. Ayesha Fernando, Miss International 2016 to represent Sri Lanka as well as the Brand Ambassador for "Visit Japan" Campaign 2017, Daisuke Kobayashi, Senior Director and Taiga Uezono, Director of the Japan National Tourism Organization Singapore Office participated in this ceremony together with other guests. Speaking at the launch, Ambassador Suganuma said, "In recent years, the number of people traveling between Japan and Sri Lanka has increased, resulting in over 20,000 visa applications being submitted to the Embassy for the first time in 2016, triple the number of applications that was received five years ago. "With the launch of Japan visa application centres in Colombo and Jaffna, we aim to cater to the increasing volume of visa applications, by reducing the waiting time and offering extended hours for submissions, as well as outreaching to nine major cities outside Colombo for applications, which would ensure greater accessibility and convenience to applicants, he noted. Commenting on the launch, Vinay Malhotra, COO, Middle East and South Asia, VFS Global, said, "With the opening of the Japan Visa Application Centre in Colombo, travellers to Japan will now get their visas processed through our professionally managed services. We are confident that these centres will positively contribute to the strong ties of travel between the two countries, by maintaining best-in-class standards of service quality for applicants." With this launch, applicants seeking visas to Japan for business, education or tourism purposes, can submit their applications at VFS Global’s Japan Visa Application Centre conveniently located in Colombo. Visa applications will no longer be accepted at the Embassy of Japan in Colombo. This new centre is located at 4 1/1, Geethanjali Place, Colombo 3. To increase accessibility to visa services for applicants living outside Colombo, VFS Global has also launched visa application drop-off centres in nine cities across Sri Lanka. The drop-off centres shall merely act as collection and distribution centres for visa applications and processed passports. All applications are forwarded from these locations to the main processing centre in Colombo. Applications can be submitted at the VFS Global Visa Application Centre in Jaffna, or at any of the Aramex ‘drop-off’ centres in Kandy, Kurunegala, Galle, Puttalam, Katunayake, Peliyagoda, Biyagama and Ratmalana. VFS Global also manages Japan visa processing services in Russia, India, Thailand, P.R. China and Vietnam, and has been serving the Government of Japan since 2010. VFS Global consistently strives to support the client government in smoothly processing large volumes of visa applications and to enhance accessibility to visa application facilities for leisure, MICE (Meeting, Incentive tour, Convention/Conference, Exhibition), and business travellers, so that the Embassy can focus on the key task of adjudication of visa applications. Key features of the centre include: skilled staff well-versed with the local language to handle applications and queries, extended operating hours enabling visitors to submit applications at their time of convenience, 100% secure handling of passports, documents and personal information, dedicated website for easy access to information including visa categories, requirements, checklist, applicable fees, visa status update and doorstep delivery of passports.